In Thailand, Durian is often eaten fresh with sweet sticky rice, and blocks of durian paste are sold in the markets, though much of the paste is mixed with pumpkin. Unripe durians may be cooked as a vegetable. The shops also sell Durian chips and Durian ice cream. What did I think?… I tentatively took the smallest piece expecting the taste to be absolutely horrid instead it is a strange combination of savory, sweet, and creamy all at once. I was hooked…..The smell I think you either love or hate it…I don’t mind it although it is really cloying and invades everything so I can understand why it is banned on airlines, some hotels, and public places. A seasonal fruit available from June to August it is in great demand here…It is sold from the back of trucks along the road, markets and in the supermarkets. It is also quite expensive due to generally having one season a year and also its popularity..
It’s also used in traditional Asian medicine, as both an anti-fever treatment and an aphrodisiac. A piece of traditional Asian folklore: is that getting intoxicated while eating Durians can lead to death. There have been some studies into an enzyme that Durian possesses which can react to alcohol quite strongly. Thailand loves Durian so much that each May, the Chanthaburi province hosts a nine-day festival to the stinky food. I hope you have enjoyed learning about this very popular Thai fruit and if you get the chance to try it …Just do it! Mangoes, peaches, and almonds are in the same drupe family as the coconut. Although the coconut is a dry drupe and peaches and mango are fleshy drupes. Well, I clearly am not a botanical expert but in my world, I have always thought of those as fruits so the coconut to me is a cross between a fruit and a nut which we eat the flesh off and drink the lovely juice of a huge seed. De-glazing is a culinary term for removing and dissolving those lovely bits of browned food you get on the bottom of your pan when cooking… by either using wine or stock it is used to add flavor to sauces, soups, and gravies. Dash...A small amount of an ingredient that is added to a dish technically equivalent to 1/8 tsp and apparently you can purchase measuring spoons to that effect. Daube...A stew, a classic French stew of inexpensive beef cooked with wine, herbs and vegetables and a famous Provencal stew known as Boeuf en Daube. Dirty Rice... Is the name given to a spicy Cajun rice dish a traditional Creole dish. Made using white rice the dish gets its color from the chopped chicken livers, sausage or ground beef made much tastier by making your own Cajun spice mix…easy to do and if stored in a screw top jar in a dry cupboard will keep for a few months. I normally make my own spice mixes and to be honest, it is easy and quick and I turnaround my dried spices much quicker rather than having a pot in the back of the cupboard which is used infrequently and loses its potency and flavor. Cajun Spice Mix for Dirty Rice. 1 tsp Cayenne pepper …I always add a bit more it depends on your spice level. Put all the ingredients in a bowl and stir well to combine …Store in an airtight pot. I love making my own spices as you can adjust the heat if they are spicy and have no preservatives so quite frankly it is a win, win situation, isn’t it? I have been doing a lot more research lately into the benefits of plants and fruits and am constantly amazed at what properties most of them have both medicinally and uses as dyes, glue and so much more. The Broad-leaved Dock leaf was also known as Butter Dock as the leaves were used to preserve and wrap butter. 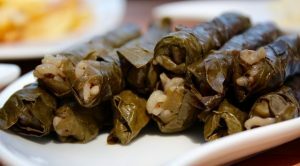 The leaves also make a great wrap for Dolmas just a 30-second blanch in boiling water and drain on paper, pat lightly so as not to tear the leaves. Secondly, sweat 2 cloves of finely chopped garlic and half an onion in some olive oil add 2 cups of cooked rice, stir gently to combine and remove from the heat. Squeeze a large lemon or lime you need about 1/4 cup into the mixture with a large handful of chopped mint and parsley. Season with salt and pepper. Refrigerate as these are generally eaten cold with a dash of lemon and olive oil. I prefer mine heated up and just very lightly sauteed in a little oil and serve with a mayo dip. But remember you want the leaves from the center of the plant the young leaves just unfurling are the best….older equals bitter. 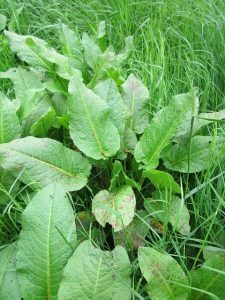 So that broad-leafed dock plant which soothed my nettle stings and was used by my mum in her kitchen when she caught her arm or hand on the oven or cooker ..has alkaline secretions which are very good and immediately neutralize any acidic sting or burn. And just a piece of trivia for you. Did you know? If you slice the dock root vertically then you can age it as it has growth rings just like a tree. That is all for this month…Next month is the letter E… I remember someone throwing out a challenge on that one and I opted for Elephants Ears which I had been seeing every day and didn’t realize what they were and their uses…Sometimes things are right in front of our noses, aren’t they? Thank you… I love it! Do you ?? I will have to go and try and find it here, not sure if I will but worth a try this weekend. I think so. Some stores sell durian products all year round, so I’m pretty sure they deep freeze it or something. But the taste is not as fresh so locals tend not to buy it during off seasons. Hi Carol, sorry I missed this was YOUR guest post. I should have guessed with the tropical fruit! How else,can only be our wonderful Carol with such an awesome post. Durian… hmm, not so much the marmite of fruits but the skunk… couldn’t get beyond the smell, sadly. Still, there are plenty of other choices to go on the bucket list. I just ♥ ♥ this culinary journey you have taken on, Me thinks, we need the alphabet Janet spoke about to get more such wonderful posts. hihi – all this talk about the smell, do I really want to go and hunt it out this weekend??? It’s totally my delight to have our mutual friend and blogger here with us. 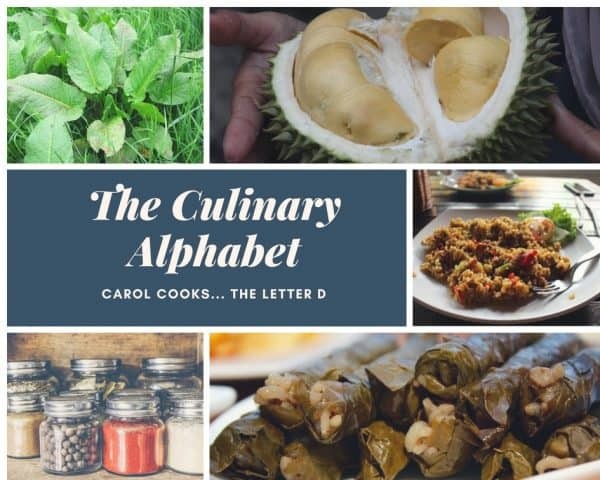 Great list, durian is legendary for how bad it smells and how great it tastes…you can’t find it much here where I live, so I appreciate the explainer! Hi John, Also not something I am familiar with, heard of it, but not seen it. Just love to learn all these new things from around the world. The more I read about this Durian, the more curious I get, so for sure I will go and hunt for it this weekend. 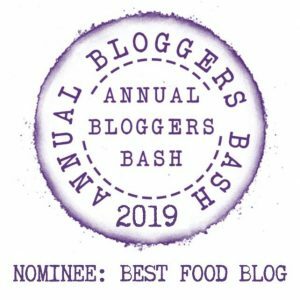 I learn something every time I do my research and I probably have a lot more to learn as well but pleased you also learnt something Lise that’s what so nice about blogging isn’t it? Thank you, thank you, thank you Carol for all the effort you put into your posts. Love your new theme, Esme. I miss not being able to reblog or give a thumbs up on your posts. A few weeks ago, I changed BrewNSpew to the WP Business Plan and found there wasn’t the option to reblog. So I had WP put BrewNSpew back to the Premium Plan and I’m using the Business Plan on my other blog, ThusNSuch. Yes, why take something away that’s working well. Do not mess and make changes if everybody (most I think) would love to have this across WP. Yes, maybe we should start a petition??? ?